I’m sure most of you know these awesome sketches from Mike Rohde about several talks, conferences and so on. 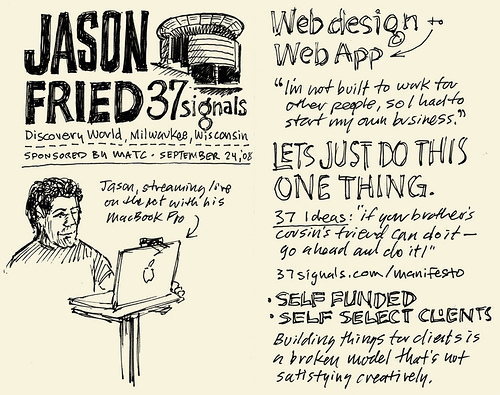 This time it’s about Jason Fried from 37signals (you know, the guys who built basecamp, …) who talked at Discovery World, Milwaukee, WI on September 24, 2008. One reason why I love his sketches lies in their inspiration. Since I know what kind of quality (and information) a sketch or note can contain, I also try to do better, when I make my own sketches. And, very important, they give me the feeling that a sketch can be worth the time it takes. The second thing I admire is the information it transports. For my opinion Mike Rhode hits exactly the idea of infographics. What means to me – showing the information at a glance. Thanks a lot for this source. Web2.0 Expo in NY is still ongoing (16. -19. Sept.). Some exciting videos can be found here. Is anyone thinking about going to the Web2.0 Expo in Berlin (21. – 23. Oct.)? The feedback I personally read about last year’s event in Berlin was not that … thrilling. Any experiences? einigen flash-elementen umgesetzt werden soll. update: zweckdienliche hinweise zu ‘aktenzeichen xy … ungelöst’ sind mittlerweile eingelangt: www.zuschauerreaktionen.de. danke michi. “bring’ 2 folien” hat bei den letzten stammtischen super funktioniert und darum: jede, die möchte, bringt 1-2 slides über das, was sie gerade im bereich interaction design, usability, … beschäftigt/interessiert mit … und stellt sie vor!